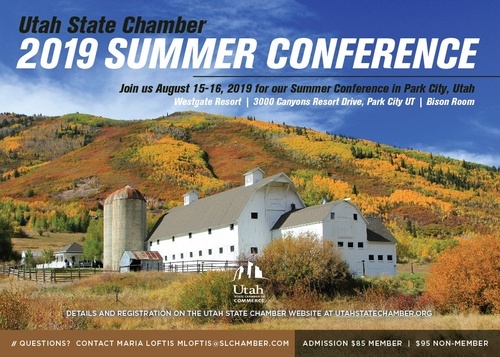 Event Description The 2019 Utah State Chamber Summer Conference will be held in Park City on August 15-16, 2019. We look forward to you joining us for two days of informational presentations and great networking. All rooms must be reserved before 6/15/2019. All reservation will be made by calling 1-877-502-7058 and giving the group code of 65-329 Utah State Chamber Meeting. If you do not provide this information to the reservation agent your reservation will not be booked properly resulting in paying the full rate for your dates. A one night deposit will be due upon booking. In addition to the room rate there is tax that will be applied to each reservation. Reservation adjustments or changes please email erin_okeefe@wgresorts.com there is no penalty to make small adjustments to your reservation after it is booked. Check in begins at 4pm. Check out is at 10am. Event Location Westgate Resort, 3000 Canyons Resort Drive, Park City UT. All meetings will be in the Bison Room.